All Thornton majors have an assigned academic advisor. Students are encouraged to communicate with their advisor on a regular basis. All students pursuing a Thornton major are required to meet with their advisor prior to registering for classes each semester (refer to the Priority Advisement Schedule). During this advisement meeting, you and your advisor will discuss various aspects of your USC Thornton experience, review your degree requirements, track your degree progress, and discuss registration plans. Additionally, D-clearances for major courses will be issued in this meeting. Please see below for detailed instructions on how to prepare for advisement and registration. * GCRT Performance and MM Screen Scoring students are not required to schedule an appointment. They will hear directly from their academic advisor regarding advisement and registration. Appointments can be made by visiting TMC 200 or by calling 213-740-4721 the week before your priority advisement week. * Units earned is determined by the number of units successfully completed by the end of the previous semester. 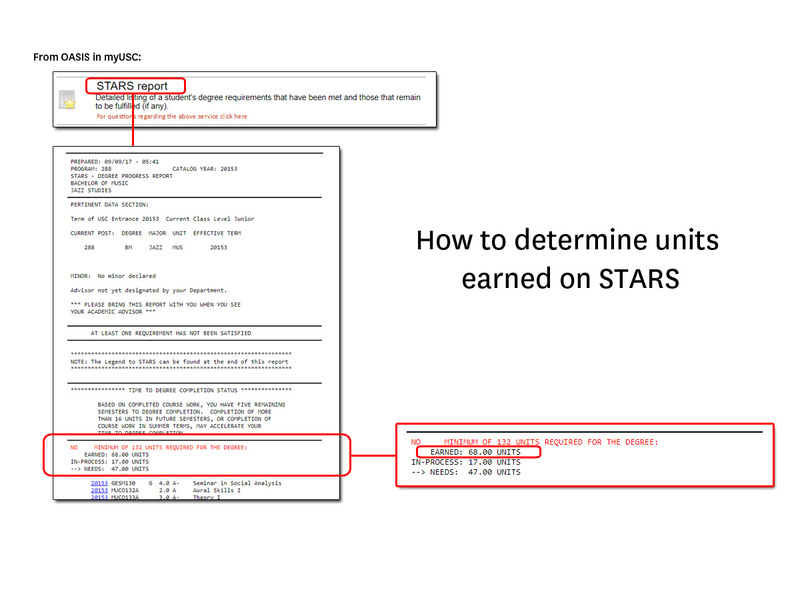 Refer to your STARS report to determine your number of units earned. SCHEDULE an advisement appointment for your priority advisement week. Appointments can be scheduled in person by visiting TMC 200 or by calling (213) 740-4721. Officially REGISTER using Web Registration for the courses you and your advisor discuss during your advisement appointment. (In general, D-clearances issued during the priority advisement weeks are set to expire on the last day of classes.) Important: it is always your responsibility to register for your classes on the Web Registration system. Your advisor will only grant you clearance to register, but you will need to officially register for the courses for which your advisor has granted you clearance. The STudent Academic Record System report (a.k.a. STARS report) reflects students’ academic progress toward completion of their degrees for their declared majors and minors. This report contains all USC course work and accepted transfer work that applies to degree requirements. How do I access my STARS report? A student’s STARS report is accessible via OASIS, by logging on to MyUSC. How do I build a schedule on Web Registration? Basic tutorials on how to use Web Registration are available on the USC Registrar’s website, here. I am an undergraduate, and I need a copy of the suggested 4-year plan. How do I get one? Various advisement tools, including the suggested 4-year plans for all majors are available online here. I am a current Thornton major. How do I schedule an advisement appointment with my academic advisor? Work with the Thornton Student Affairs front desk staff in TMC 200. You can either stop by in person or call 213-740-4721. How does priority advisement work at the Thornton School? During priority advisement, Thornton advisors see graduate students on a first-come-first-served basis, followed by undergraduate students during designated weeks based on units earned (units earned is listed on the student’s STARS report). Thornton Student Affairs will send an email message to all Thornton students, usually around the seventh week of the semester, to announce the calendar for priority advisement for that semester. D-clearance is an abbreviation for “departmental clearance.” D-clearance is required when the department offering the course restricts enrollment in the course. The purpose for this restriction generally relates to either the need to reserve spots in the course for students who need it to fulfill degree requirements, or the need to assess a student’s readiness for the content covered in the course. Most courses in the Thornton School require D-clearance. How do I know if a course requires D-clearance? The course will have a letter “D” after its five-digit section number listed in Web Registration and the Schedule of Classes. If the course has a letter “R” after its five-digit section number, then the course does not require D-clearance. You are able to register for “R” classes without departmental clearance, so long as space is still available in the class. How do I obtain D-clearance? D-clearances are issued by your advisor during your advisement meeting. Please follow the process described above to schedule your advisement meeting. You will be assigned a “Permit to Register,” which is the earliest time you can complete registration on the Web Registration system. Once you have been granted D-clearance for a course, you can register for the course any time after your Permit to Register. It is important to note, however, that unless otherwise advised, your D-clearance(s) will expire on the last day of classes for the current semester. Your Permit to Register is viewable on OASIS. 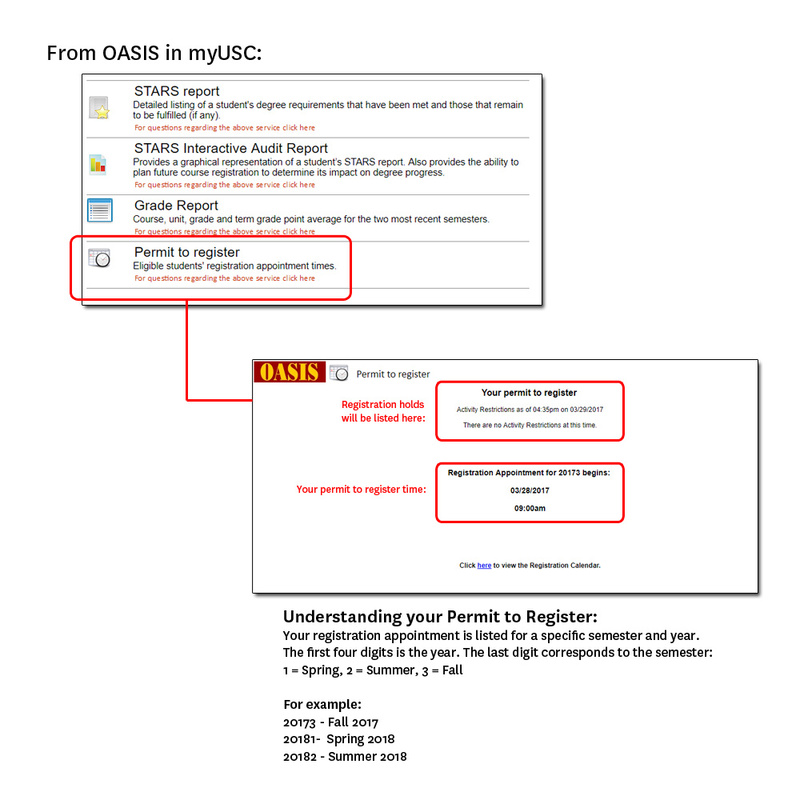 You can access OASIS via myUSC. My D-clearance expired before I was able to register. What do I do? Please contact your advisor to see if your D-clearance can be re-issued. Many courses fill up quickly, and it may not be possible to re-issue your clearance. So, be sure to register as soon after you receive D-clearance as possible. Classes have already started for the semester. How do I request D-clearance for a course (not individual instruction)? Once classes begin for the semester, instructors manage their own class rosters. To try to secure a seat in a course that requires D-clearance, you will need to gain the instructor’s approval with a Thornton Course Addition Clearance Form. You can pick up this form in TMC 200 during regular business hours. If possible, attend the first day of class with this form. If you’ve already missed the first day of class, plan to attend the next class session or reach out to the instructor via email to request approval. If there are open seats in the course and the professor approves your enrollment, s/he will sign the form, which you should then bring back to TMC 200 for processing. Once you are granted clearance, you will need to officially register for the class on the Web Registration system. How do I know which classes are required for my music major? Please refer to your STARS report for major requirements. You can also refer to the USC Catalogue or the major requirements lists here. Please note that your required courses will depend on the Catalogue year you are following, which is usually the year you started at USC. If you have questions about your specific major requirements or your Catalogue year, please contact your advisor. How do I add a music minor? To be considered for admission to a music minor, you must submit an application. Please refer to the minors section of the Thornton Admission website. If you have any other questions or concerns, please contact Thornton Student Affairs. Our office is located on the University Park Campus in The Music Complex (TMC), room 200. You can reach our office by calling 213-740-4721 or via e-mail at thornton.studentaffairs@usc.edu.